OHHHH, I forgot to tell you guys. THE BAGS BEHIND MY HEAD LOOK LIKE A BOW AND I LIKE IT, I LIKE IT A LOT. 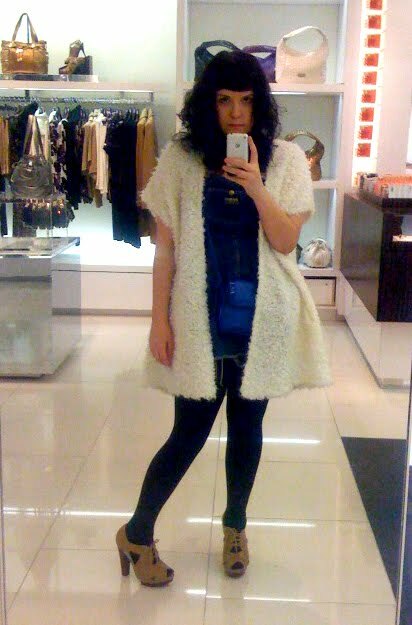 I got a giant swingy curly wool jacket cardigan thing that is akin to a luxe bathmat. It has pockets. And it makes me feel like a Yeti. In the BEST POSSIBLE WAY. I bought it at Barney's with a gift card from my birthday LAST YEAR (ew, hoarder, tmi?) and I truly believe that items such as THESE are the exact ones that are made for gift cards. Buy the most ridiculous bang you can for the free bucks..ya dig? I love it. I pet myself. And it's freakishly warm, for something without sleeves. It may need a name, it seems slightly alive. And just so we can see that sometimes yo STYLE stays the SAME, here is a pic of me at age 4. Same bangs. Same Osh Kosh B'Gosh. Def still have sandals like that too. SO nerdy! I knew what was up though, look at that POSE. haahaha. sylish fo' lyfe! and it only gets better! as my fellow blogger and bff once said "It looks like a giant pink ruffly diaper, and it's my life." blahblahbl idrk............the context is there. it's kind of fantastic. it definitely needs a name. love those shoes! Sherpa = good look for you!